Each cycle, Michigan Humanities will partner with schools, libraries, museum, religious organizations, book clubs and more to create a unified discussion. Each partner receives free supplemental materials, such as reader’s guides, teacher’s guides and bookmarks; select nonprofits are eligible to receive free copies of the selected title. As of September 2018, there are no remaining book copies for distribution, but other resources are still available. Materials: Bookmarks, reader’s guides, teacher’s guides, posters are distributed to all partners. Publicity: Michigan Humanities will publicize the events your organization schedules related to 2017-18 Great Michigan Read. 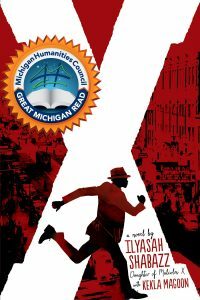 Books: Nonprofit organizations-including schools and libraries-may request up to 30 copies of X: A Novel. Preference will be given to organizations that have a plan for circulating the books to multiple readers. Events: Submit dates and locations for all of your Great Michigan Read programs using the online event submission form. Attendance numbers and program costs must be reported to Michigan Humanities. Evaluation: Administer one-page participant evaluation forms and complete a program coordinator evaluation form. Event attendance and costs must be reported to Michigan Humanities, via our online form.